Bird deck houses are one way of making your home feel brighter and livelier every day. It is the first thing that you can look at in the morning and the thing to see once you want to relieve some of the stress of your day. Believe it. Birds and birdhouses in your home can make a lot of difference not only to your home but also to your life. Building a bird deckhouse can be easy if you know what you are doing. There are some guidelines that you can learn from those who have done it. Bird experts have also some things to say about how to properly make your own bird deckhouse. Overall, below are some of the things you have to consider when building a bird deckhouse. You probably would not want to suffocate the birds inside your house. And you probably would not want to make them feel like they are your prisoners too. What you need to do is to provide proper ventilation in your bird deckhouse. If you have one that is fully covered, consider putting on holes on the top, bottom and the sides. You do not need to do this if the bird deckhouse has an open space where birds can move out and about. If you have a pet bird that you do not want to fly away from you, consider having birdhouses that let the air in naturally. Having a roof on your bird deckhouse is a means of protecting the birds from wind and rain. It is also one way of preventing bigger animals from playing and eating the birds inside. In addition, the roof can prevent moisture from seeping inside the birdhouse. This serves the same purpose as the walls that you need to have in the birdhouse. If you have more than one bird deckhouse in your house or garden, keep them some feet apart from each other. Having the appropriate space between bird deckhouses is a way of reducing conflicts that might arise between the birds. Birds are also like a human in terms of protecting their territory. They also do not want other birds to trespass into their space. It is better to give them the appropriate space that they can have for their own. The best material to make your bird deckhouse from is wood. They are more durable than metal that can rust and cartons that rot. Avoid using paint as much as possible. They tend to secrete vapors that can harmful for the birds. Check out for unwanted visitors in your bird deckhouse. They can be insects or mice capable of causing harm and injury to the birds. Regular checking and cleaning can prevent these things from taking advantage of what you consider as pets. The main purpose for putting up a deck in your birdhouse is to attract more birds. Your bird deckhouse will be a waste if birds are not visiting and coming back to it. An exception is when you already have the birds to put into your birdhouse. But for those who do not have, then the birdhouse should be a point of attraction and a regular safe place where birds can stay. When it comes to birds, avid watchers know that you can never have too many birdhouses in your yard. Birds appreciate these items during the nesting and migration seasons, which can just about cover the entire year in some areas. So, if you are trying to attract birds to your yard, you should certainly create a place that is inviting and appealing to them. They will reward you with their presence and you can enjoy gazing at some of the most beautiful items nature has to offer. If you are interested in birdhouses, you may want to consider making your own. You can create interesting birdhouses in no time, using simple household items. Use these tips to create an easy coffee can birdhouse. To begin you will need to collect an empty coffee can, super glue, paint, a small wooden peg, fishing line, a permanent marker, and a utility knife. Begin by washing the coffee can with soap and water. Be sure to rinse it well. If there is much residue in the can, birds will not want to stay in it. Dry the can and replace its lid. Next, trace a circle onto one side of the can, near the bottom. This will be the entrance for the birds. The circle will need to be large enough for birds to enter, but not too large. Some birds prefer the entrances to be smaller because it allows them safety from larger preying birds. After tracing the hole, use the utility knife to carefully cut the entrance for the birds. Next, glue the wooden peg just below the entrance. This will be a great place for birds to perch, especially if a bird has babies inside and is trying to feed them. Be sure to allow enough area for the entrance however as well. After the glue dries completely, you can move on to decorating your home. Using paint or anything else you would like, you can make this type of birdhouse into anything you would like. Be sure to remove the label if you haven’t already done so. You can paint the can to honor your favorite football team or paint lovely flowers on the side to match your garden. The possibilities are unlimited. This is a great time to get little ones involved as well. Children love to help with crafts and painting a birdhouse is one that children of all ages can participate in. After the paint and decorations dry, you can poke a small hole in the back of the can and loop your fishing line through. This will allow you to hang the house on a tree. You can also choose to bolt the house to the tree. To do this, remove the coffee can’s lid and place the bolt through the inside back of the can. This simple craft is a wonderful way to attract birds to your yard for you and your family to enjoy all year long. The location of the blue bird house is one of the major considerations you have to take when building its house. This is because these birds do not prefer living in urban places. Most of the time, you will find them in farmlands and pastures. So it is not surprising that those who want to have these types of birds in their area are setting up blue bird trails to lure them into a location just like what they are used to. In order to build a blue bird house, you need to have intensive knowledge of these birds and their behaviors. One way of doing this is through observation. If ever you did stumble into a blue bird, watch closely how they move about and what type of house they are building. Another way of doing this is to ask bird experts. They will be able to point out some important factors to consider when building a blue bird house that will suit the birds that you want to attract. Unlike any other types of birds, blue birds have an instinct that tells them how sparrows and starlings are preying on their breed. This is what makes them choosy when it comes to building their houses. They have a knack to just ignore locations which they think are not safe and are not adhering to what they want. Experts are saying that the best type of birdhouse to build for blue birds are wooden ones that are situated in rural areas that have open spaces. The best location is those that are placed high on a pole. Determining the right height is important in preventing the invasion of sparrows. It can be noted that blue birds fly away at the first sign of the approaching predators. This is the reason why the right height is crucial if you want to make the blue birds come back to the birdhouse that you built for them. Upon building the blue bird house, make sure that you provide enough ventilation for it. Keep in mind that blue birds choose the type of home that they will feel secure in. That means that you have to cover the bottom part with clothes so that other animals will not be able to get through them easily. If ever the birdhouse is perched on a high location, make sure that you grease the poles beneath it to prevent larger birds from accessing the blue bird house. If you want to attract blue birds easily, use food. 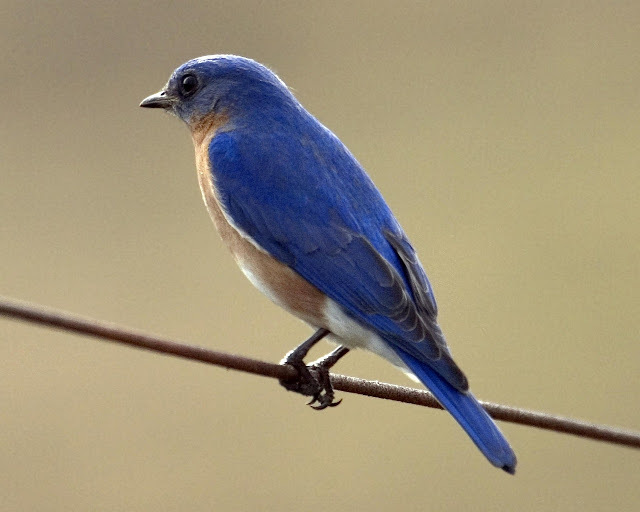 Blue birds are the types of birds that nibble on anything they set their eyes on. You can lay out some raisins, peanuts, white bread or cheese near the birdhouse and you will surely get their full attention. Make sure that you have an abundance of their favorite food around so that you can easily get the attention of blue birds. You will be able to find some blue bird house designs for a price. But if you do not want to spend an amount of money for it, you can do a search over the internet and you will be presented with lots of ideas on building a blue bird house. Along with these are some advice to learn about blue bird behaviors and how best to get into the good side of these choosy birds. After a long snowy winter as I get to work in the garden I discovered the need to completely redo the birdbaths, birdhouses and other bird-friendly aspects of my garden. Rain, snow, and ice did major damage to the pond, the birdbath fountain, the decorative birdhouses and all the bird feeders. Wow! I didn’t have this much maintenance on my own house. Of course, the bears took out their spring energy on the decorative bird feeders and the raccoons keep hanging off the more unique bird feeder because they appear to love that seed mix. Is there a seed mix that doesn’t attract as much wildlife as it does birds? I love fancy birdhouses, so do my feathered visitors. They flock to the unique bird feeders and great designs of the decorative birdhouses and argue over who gets to move in. I have a decorative birdhouse shaped like a lighthouse and 2 sets of chickadees got into a rental war before one moved in and made it her own. Some of the residents of my garden prefer the birdhouse feeders. I guess that way they don’t have to go far for food, live upstairs eat downstairs. I also appreciate the more unique bird feeders, especially those designed to thwart the squirrel population. Will someone please explain to me how I can have 4 different kinds of squirrels in one yard? The raccoons keep taking the pump out of the pond to play with it and they burn out the motor so I decided to switch to a birdbath water fountain where they couldn’t reach the pump. This works great but makes sure to place some rocks in the basin so if someone falls in they can get out again. Even if you have raccoons make sure to have running water in the form of a small birdbath fountain, a birdbath or a pond. Your birds need and enjoy the sound of bubbling water and the availability of fresh water especially as we go into the dog days of summer. Enjoy the finer things in life this summer, enjoy your garden!